For me, one of the hardest things when on the road is how I feel physically by the time I get to our destination. I imagine many travelers can relate to that sluggish, gross, road-worn feeling. Frankie and I don’t tend to cook much, if at all, the last week of an assignment because the priority is packing up all my kitchen supplies. For those last 7-10 days, eating out is inevitable. 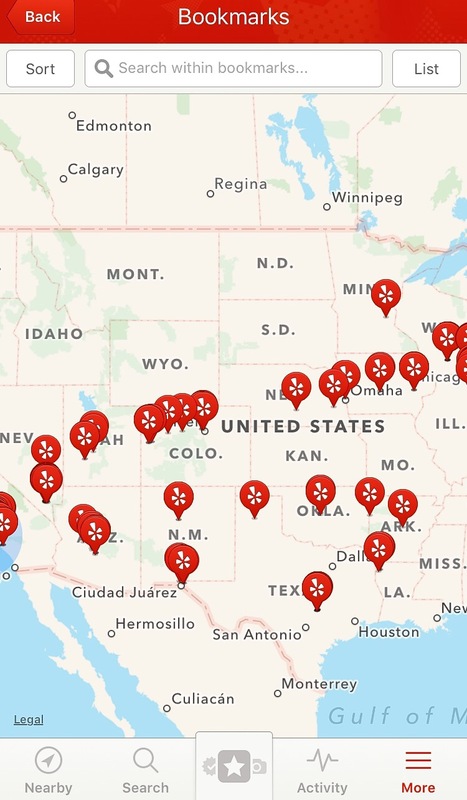 This app has not only been a life saver when looking for a clean restaurant to grab some quick nourishment, but its helped to make our road trips a collection of food-journeys. (Hint: We typically stay away from anywhere under 4 stars.) I’m sure most people at this point have heard of and used Yelp for years, but there are some tricks I’ve learned along the way when sorting and filtering restaurants in areas outside of major metropolitan locations. Even out in the middle of nowhere, fellow reviewers tend to find the Mom & Pop shops that sometimes only do one thing, but do it well. However, this isn’t to say that Yelpers get it right every time. You do have to dig a little deeper when looking at review grades in these less populated areas. For example, lets say you look at a French Crepe restaurant in Podunk, North Dakota that has a 3.5 star review. Rather than quickly move on to the next one, especially in areas where there may not be a single place above 3.5 stars, take a bit and read the actual reviews. Are the negative ones about the service? I’ll take crappy service with good food over amazing service with crap food any day! Or are the reviews about cleanliness and under-cooked chicken? Although their menus ate relatively healthy, some locations in the middle of nowhere are lower on the “health & safety standard” spectrum. They are worth yelping before taking a chance out of desperation. If you do end up in a metaphorical dead food zone, the safest bet it to take that as a sign. Find a grocery store and buy yourself a nice salad from prepared foods section of the store. Give your stomach a break, and your body a boost of veggies and maybe some grilled chicken. Ready Pac Salads are at most chain grocery stores nowadays. Thankfully, there are so many Whole Foods Markets throughout the country now. You can always stop off here and visit their salad bar or hot foods section. While you are there you can stock up on some healthy road snacks and food that will hold well for later that night to have for dinner. Its also important to try to plan ahead as much as possible, especially if you don’t have a co-pilot to search for you as you drive. Bookmarking destination eateries and planning your driving breaks accordingly will also make the travel itself a lot easier. For me, it gives me something to look forward to during those long slogs across multiple states, or the dreaded forever state of Texas. When my husband was assigned to Stanford University, we had to go up to Nor Cal and back down to So Cal a few times. Each time we stopped at the Nipomo BBQ and Deli near Santa Maria, Ca. 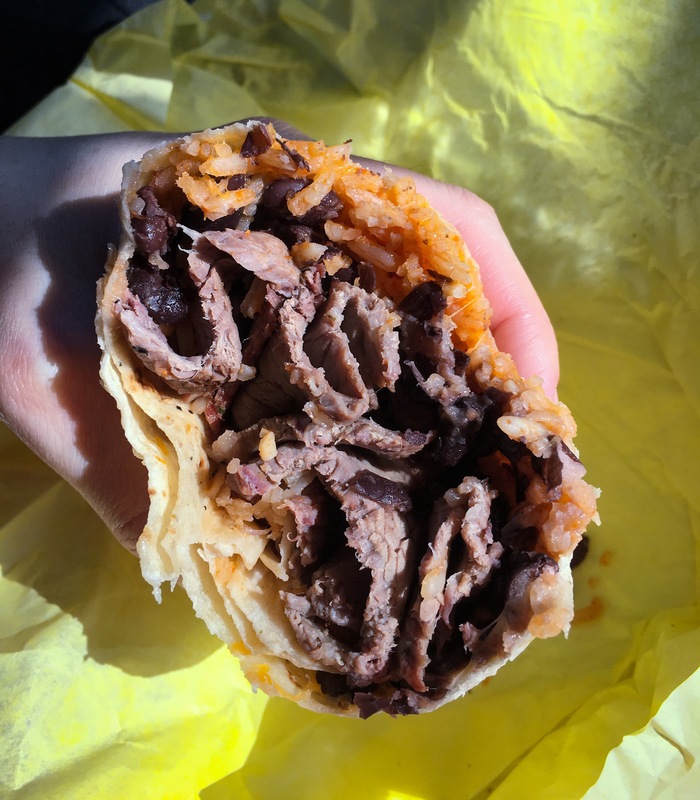 They have, hands down, the best Tri-Tip burrito I’ve ever had. This unassuming “hole-in-the-wall” is the clearest showcase of the Santa Barbara Tri-Tip I grew up eating in my house. To all of you who don’t know, I’m about to school you on a food truth. Tri-tip should NEVER be smothered in BBQ sauce. It should be well marinated, or seasoned, BEFORE cooking. Then it should be slow cooked on the BBQ, and sliced thin. You can make sandwiches or burritos with it, only adding salsa or avocado when it comes to condiments. It’s a travesty to see what some people, restaurants, and states are calling “Tri-Tip”. They’re cooking the hell out of it, chop it up like brisket, and smother it in BBQ sauce or God-forbid, mayonnaise. Not cool. Do your homework and make the most out of the trip. Don’t settle for drive-thrus or fast food. Remember, its about the journey and not the destinations. Well, its also about the destination, but you get what I’m saying!